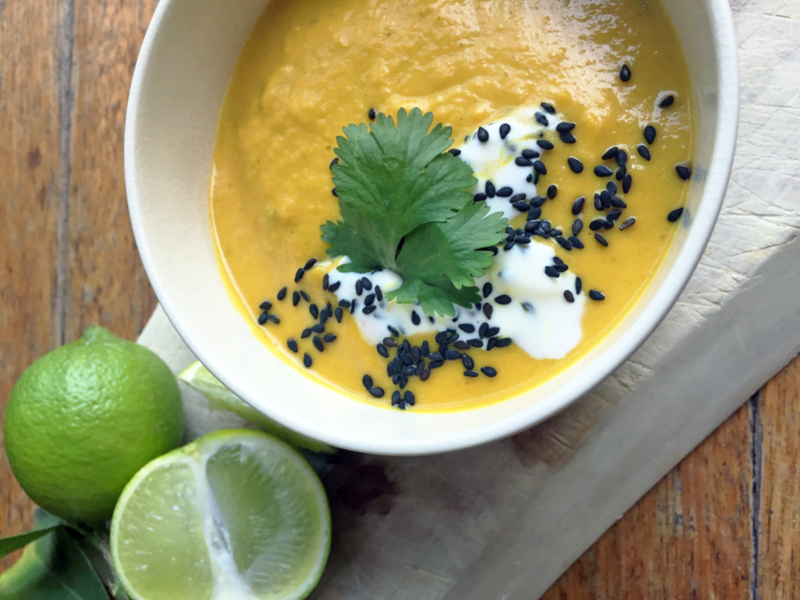 A bowl of homemade, tasty soup is a wonderful way to get your body fuelled – not only with nutrients, but also with a whole bunch of happiness. If you enjoy cooking, you can have so much fun experimenting with different combinations of vegetables, herbs and spices to create a unique flavour every time. 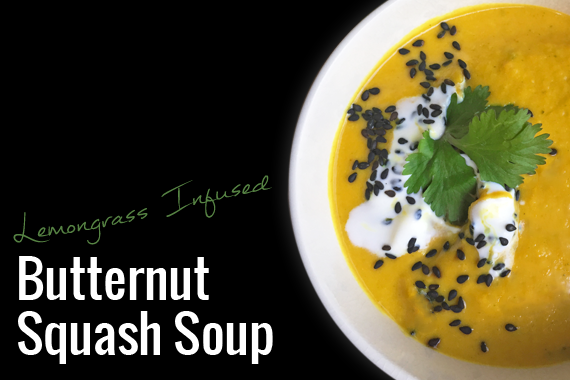 This Thai inspired Butternut Squash Soup turned out so yummy and deserves it’s own post. To give this soup it’s unique flavour you will need two specific herbs: fresh ginger and lemongrass. Many of you might be pretty comfortable cooking with fresh ginger root but what about lemongrass? This plant is very common in the Thai and Vietnamese cuisines. It has a mild citrus flavour – hence the name. It’s usually used as an herb and flavouring in curries, soups, and curry pastes. It’s also popular for tea. Lemongrass can usually be found in the produce/herb section of fancier grocery stores or in an Asian supermarket. 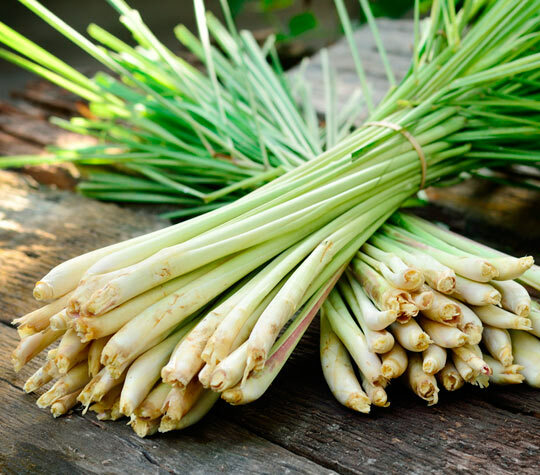 Tip: Lemongrass is typically much cheaper and fresher at an Asian market as there is a higher turnover. Fresh lemongrass stalks should feel firm and heavy, with no bruising. If it feels light, it will probably have dried out too much. Though lemongrass stalks measure a foot long or more, almost all of the flavour is contained in the bottom 5 inches or so of the stalk. To get to that flavour, cut away the thinner top portion of the stalk and the very woody base. Then peel away the tougher outer layers to get to the more tender part of the stalk. Tip: You can use all these scraps to make a soothing herbal tea; steep them in boiling water for 5 minutes, then strain. Stored wrapped, in the fridge, fresh lemon grass will keep for a couple of weeks or freeze for up to six months. 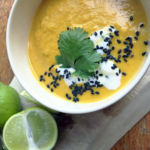 Ok, time to get cooking and try this bright and satisfying Butternut Squash Soup that will get you through the remaining winter months. Enjoy! Toss the butternut squash with 3 tablespoons of the oil and 1/2 teaspoons salt. Spread on a parchment lined baking sheet and roast for 30 minutes until soft. In a large saucepan over medium heat, heat the coconut oil. Add the onion and cook until translucent, about 8 minutes, stirring occasionally. Add the celery, ginger, lemongrass (tough outer layers removed, cut into 2-3 inch lengths and “bruise”) and turmeric and stir to coat everything with the oil. Reduce the heat to medium-low and cook for 10 minutes. Add the coconut milk, water, aminos and roasted squash,increase the heat to medium. Bring the soup to a simmer and cook for 10-15 minutes to mingle the flavours. Remove from heat and allow to cool for 5 min. Then transfer to a high speed blender and blend until smooth, blending in batches if necessary. Add the lime juice and blend again to combine. Garnish the soup with sesame seeds, chopped cilantro, a drizzle of coconut cream and some red pepper flakes if desired. Remove the lemongrass pieces before serving.